“Father Jamil Haddad, an Orthodox priest was kidnapped and found dead on 25 October in the Drousha area, Damascus. There were indescribable signs of torture and mutilation on his body. The Greek Orthodox Patriarchate of Antioch defines Fr. Haddad a “martyr of reconciliation and harmony.” In fact, the priest “had engaged in a noble humanitarian mission to free a member of his parish who had been kidnapped a few days before.” In the mediation, Fr. Fadi was kidnapped along with another intermediary. The kidnappers demanded a huge ransom and then killed him. During his captivity he was tortured, his eyes were gouged out and the flesh was ripped from the top of his head. Later his body was dumped by the road side and was so badly mutilated it was hard for those who knew him to identify his remains. Fr. Haddad’s Patriarch, his bishops and his fellow priests confirmed that this was the work of “unidentified gangs”; they fear to go further in stating what they know. Neither clergy nor Father Haddid’s parishioners ever blamed the government. However, the newly appointed leader of the external opposition group, the Syrian National Council, George Sabra, blamed “gangs belonging to the regime”, according to the Saudi media outlet, Al-Arabiya News. In mid August in the town of Maskaneh, Riqqa Province, the “Mussalaha” reconciliation initiative lost one of its members, a much loved and respected, Sheikh Jamaan al Khafagy who along with his nephew Ali, and his assistant were abducted, tortured and executed, having their throats cut, by members of the Free Syrian Army following their entry into that town. An armed terrorist group assassinated with gunfire Sheikh Mahmoud Hassan al-Ghannash, from Jadeid Akidat village , near Crossingroads to Jasem village in Deir Ezzor. An official source told SANA reporter that the daughter of Sheikh al-Ghannash was injured in the attack which targeted his car while his brother was not hurt. Armed men assassinated the imam of the Ruqayya mosque, Sheikh Abbas al-Laham in the Syrian capital Damascus. The attackers shot dead al-Laham on Sunday, while he was heading from the mosque to his home. He is one of the several religious figures killed in the country in recent months. Al-Laham’s assassination came a day after the head of the UN supervision mission described the situation in Syria as calm. Listed below are the main Arab tribes that have given their consent to Mussalaha. Some of these tribes have paid dearly for their ‘collaboration’ with Mussalaha. For example, the leader of the Berri family, Zeino Berri, was killed with eleven family members in Salahaddin district, Aleppo, by the Salafist Unification Battalion (Liwa Al Tawhid) at the start of the Aleppo invasion by mercenaries from northern Syria and Turkey. 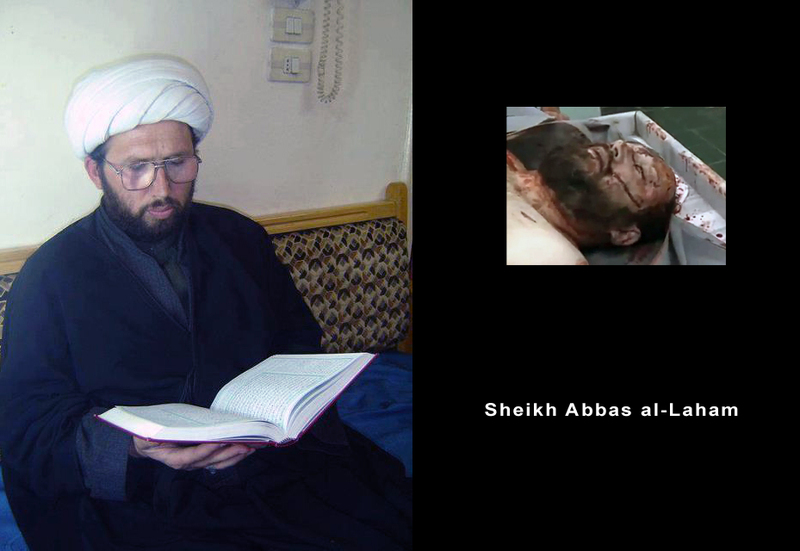 Sheik Mohammad Ahmad Ouf Sadeq, a leading religious figure in Damascus, was assassinated on February 16 2012. Sheik Mohammad Ahmad Ouf Sadeq was an imam at the mosque Anas bin Malek, in the conservative Midan area of the Syrian capital. When he was returning to the capital, an armed group intercepted his vehicle in Qadam Assali, in the Damascus suburbs. Sheik Sadeq, 36, had a Ph.D. in Sharia law, and is survived by four children. He had strongly condemned a January 6 terrorist attack in Midan and called for national unity. The January suicide bombing had killed 26 people and injured more than 60 others. It should be noted here that Sarya, the son of Dr. Ahmad Hassoun, the Grand Mufti of Syria, was assassinated last October together with his history professor. Although it cannot be claimed that the son of the Grand Mufti was a public supporter of Mussalaha as he was killed before the formal setting up of the movement, it could be claimed he was a target of extremist groups as his father supports peaceful change. To judge if Sarya was a fair target of rebels, it helps to consider the circumstances of his death and the speech of his father at his funeral.